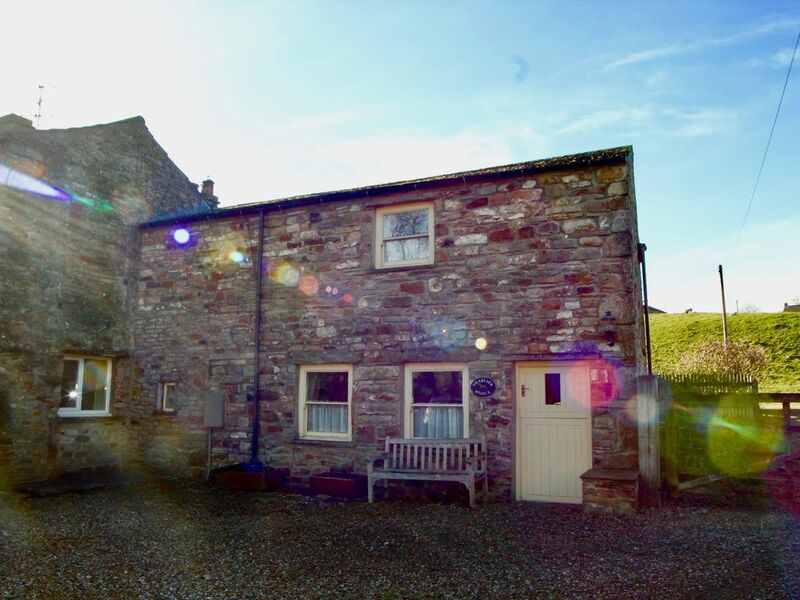 Charlie’s Stable is a superb Holiday Cottage nestled in a beautiful, quiet corner of the village of Reeth in the Yorkshire Dales. Romantic getaway - sleeping 2 people in a large vaulted oak beamed bedroom with gorgeous views up to Fremington Edge. There is plenty of private parking, and has its own fully enclosed and secure garden for peace of mind if you are bringing your dogs. It is supplied with Biomass central heating and hot water. Charlie's Stable has been lovingly restored from its original use as a stable. The proprietors have ensured that everything has been thought of, so that you can rest peacefully on your visit here. Downstairs comprises of one large open plan living area - a luxury fully integrated kitchen with washing machine, dishwasher, fridge and freezer. The sitting area is cosy with a log burner and 43" smart TV and Netflix subscription. Upstairs, is the spacious bedroom with lots of character. A sumptuous super king size bed with crisp white sheets awaits you after long days adventuring around the dales. Relax and unwind reading book or watching the 32" TV from the snuggle chair whilst enjoying a glass of something cold. The bathroom is beautifully tiled with a vanity sink, LED mirror with shaver socket, double ended bath and a separate rainfall shower. Set in the beautiful countryside of Swaledale, surrounded by farmland and stunning views from every window the house boasts its own unique history. It is so quiet and tranquil in this corner of the village, all you can hear are the birds, the sheep and the Arkle beck which runs nearby. The village of Reeth is an ideal base for exploring the Dales. It is a bustling community, with pubs, restaurants, cafes, shops, a museum, a hairdressers an ice cream parlour, a beauty salon and a market every Friday. Visitors are never short of things to do, and that's before we mention the many, many walks starting right on the doorstep. The village centre is a 2 minute walk from these properties. We are pet friendly! Your dogs are more than welcome in the cottages. They will love the Yorkshire Dales as much as you! ✅Towels, bedding heating and electric are included. Charlie's Stable is so called because Charlie was the last horse to be stabled here when this area was a hive of activity producing electricity between 1911 and 1948. There are 3 other cottages that can be let at the same time for a larger group. All cottages are next to each other. These are Burton House, Turbine House and Greystones. Advertised on this website. Charlie's Cottage was a perfect place to stay for a relaxing long weekend away. 5 minutes walk to the lovely Reeth Village with 3 nice pubs and endless walks. The cottage itself was just the right size for a couple and was equiped with everything we needed. Some added extras were eggs, milk, biscuits, tea and coffee. Lovely large bedroom and bathroom with top quality bedding and towels. The bed was huge and so comfy. There was plenty of storage space too. Cosy living area with open plan kitchen. Free access to Netflix and WiFi. We didn't make use of the log burner as the heating settings were spot on. Another thing we didn't make use of was the lovely garden area across the yard next to the river. Wrong time of year for us but would be lovely to make use of in the summer. You can see so much work effort and quality has gone into this little cottage yet the cost to rent it was very reasonable. Would recommend to anyone wanting some relaxing time away. A warm welcome package to greet us in this outstanding accommodation. All amenities available. Close to the village with 3 nice pubs. Many close walking routes in this lovely. countryside. We had a lovely stay at Charlie's Stable. The cottage has been refurbished to an extremely high standard and we really appreciated all the little extras like tea, coffee and milk. The kitchen was well equipped and had everything we could possibly need. The bed was super comfy and simply huge with high quality bedding, what a luxury! We would highly recommend the cottage and would love to come back one day. An absolute fabulous cottage, wonderfully designed and so very cosy and warm for cold winter nights. It has everything you want, it is home from home. We loved our stay in Charlie's cottage, Reeth. It is a beautiful location and there are walks from your doorstep. Rose and David and there famiy are lovely people and we look forward to returning to Reeth in the near future. Thank you for a fantastic holiday.